Pollination of Great Burnet is by insects, which are attracted to the colourful flowers that are easily seen from a distance because they aree taller that most of the other wildflowers around them. 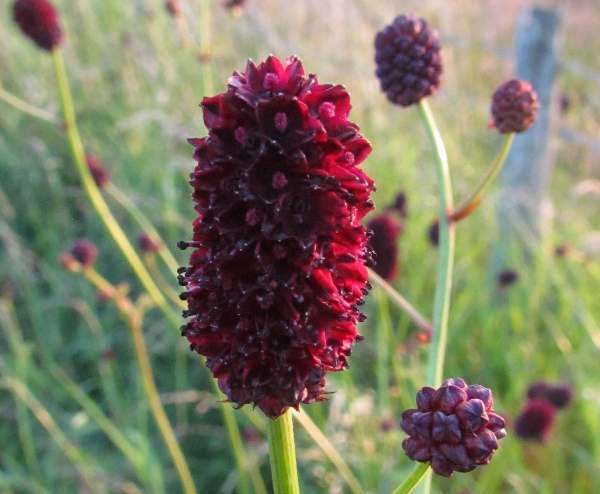 Great Burnet is a distinctive and impressive herbaceous perennial plant, growing to about a metre in height. 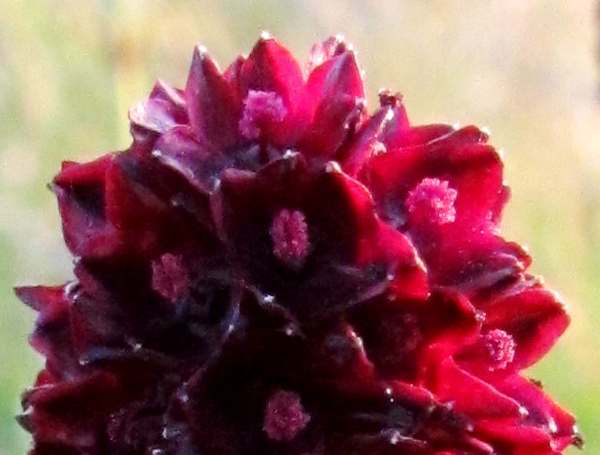 Each deep, blood-red flowerhead comprises numerous tiny, closely-packed flowers. 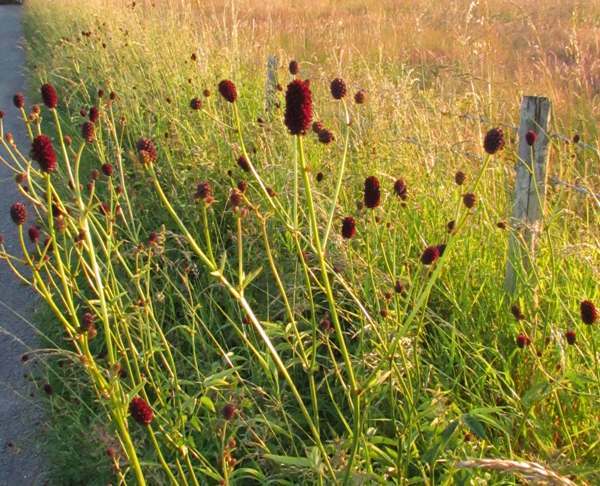 The territory of Great Burnet is in decline due to habitat destruction, and it is mainly found in the southern half of Britain and through the central part of Ireland. Elsewhere in the world this wildflower is native throughout the cooler regions of the Northern Hemisphere including mainland Europe, northern Asia, and the northern part of North America. This easily-recognised member of the Rose family grows in damp meadows and along stream and riverbanks, where sadly it is an increasingly rare sight. Great Burnet flowers from June through to September. The leaves of Great Burnet are sometimes collected to use in salads, and they are reported to tase rather like cucumber. This is also an important foodplant for the larvae of some butterflies, and in herbalism it has been used to treat wounds and to stem bleeding. Sanguisorba, the genus name, rerers to the use of various members of this group of plants for 'absorbing blood' - in other words to stem bleeding. The specific epithet officinalis also indicates that this species is reputed to have medicinal/ pharmaceutical properties. Salad Burnet, Sanguisorba minor, is a much smaller and altogether less spectacular wildflower; it grows in dry calcacareous grassland but has long been cultivated as a kitchen herb for its mild-tasting leaves. Less attractive to insects than its larger, brighter close relative, Salad Burnet relies mainly on the wind to distribute its pollen. The specimens shown on this page were photographed in East Anglia in July.